Developing a diabetes self management program entails assessment of your audience’s needs, assessment of your organization’s strengths, selection of key program elements and approaches, ways to assess progress toward improvement and a plan for integrating effective approaches into the system of care. The Diabetes Initiative developed new tools to facilitate the advancement of self management supports in primary care settings and through clinic-community partnerships. These are self assessment tools intended to help assess current status and suggest areas for improvement. Programs for self management do not prosper if they rely on the heroic efforts of a few staff members. Rather, organizational factors and system features need to facilitate consistent and high-quality provision of self management support. The Diabetes Initiative identified key characteristics of self management support in primary care and developed a tool that can be used by teams wishing to improve self management supports in their settings. Clinics, community organizations, and other groups can develop partnerships to extend the range and variety of opportunities and supports for self management. These reflect the reality that diabetes management takes place in daily life, not in clinics. The Diabetes Initiative identified key characteristics of effective partnerships and developed tools to help track their progression and improve outcomes. Managing negative emotions is important in diabetes management. A range of strategies to address these include support groups, self management classes, supportive community health workers, counselors on the diabetes care team, medication, and as-needed referral care. But healthy coping isn’t just for people with depression. All individuals can benefit from improving their coping skills, and all 14 Diabetes Initiative grantees incorporated this aspect of self management into their programs. For more information on healthy coping, download Healthy Coping in Diabetes: A Guide for Program Development and Implementation. When patients have questions about their diabetes they need convenient access to someone they can talk to. At the same time, they need to be contacted periodically to see how they are doing, even if they haven’t checked in with their diabetes team. Thus, routine contacts by the healthcare team as well as “as needed” options for patients are key to sustained self management. Called by a number of names (“promotora,” “coach,” “lay health worker,” etc. ), CHWs play a variety of roles in diabetes care. These include (a) instruction in key skills for self management and problem-solving to apply self management plans in daily life, (b) emotional support and encouragement, and (c) facilitating effective communication among patients and their healthcare teams. They offer unique services and functions not provided by traditional healthcare teams. 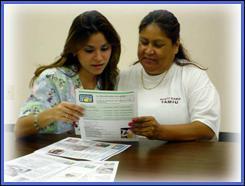 To date, CHWs are used primarily in programs that serve underserved populations. Their contributions to high-quality diabetes care would be beneficial to all adults with diabetes.